Jana shared her Swiffer dusters 360 review below. I used the 360 duster last week and I really liked the product. It was very easy to find at the store. I bought the starter kit version, so it came with the holder and with three dusters. I used it to clean all around my living room and dining room, including the blinds, television, bookcase and surfaces like the coffee table, side tables, decorative vases and picture frames. It did a really good job of locking in all of the dust and not just spreading it around like my washable microfiber duster tends to do. I used the product and threw it away, since it had been a while since I had dusted. I think that when I dust more regularly, I should be able to use the same duster refill a couple of times before having to throw it away. The starter kit was a good deal, it was on sale for four dollars, and I had a dollar off coupon. coupon to make the price more reasonable. Overall, I thoroughly enjoyed this product. It cleaned well, and it was nice to just be able to throw away the dusty mess than use a bunch of paper towels or have to wash a reusable duster or cleaning cloth. Thanks for your review of this product Jana. I'm glad to get a review of this newer version of the Swiffer dusters. I've gotten quite a lot of reviews of the original version here for those who are interested. This newer version, as you might be able to tell from the name, has a dusting service all the way around the wand, instead of a dusting surface and a flat surface like the original version. I would love to hear from more people who've used it, sharing what you think of it, and how it has worked for you, good or bad. You can share your reviews of dusting equipment here for this or any other brand of product. 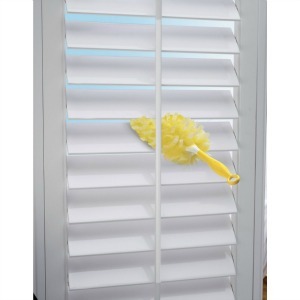 Further, many people use this product to dust their blinds, just as Jana mentioned. You can check out more blind cleaner reviews here, or share your own.